It’s December which means it’s time to show you the makeup I wore in the past month. Last month was all about high end face products, affordable eyeshadow, berry lips and I have been dabbling into primers and setting sprays. Especially those last two steps in my makeup routine are very new to me and are areas which I have just started to explore in the world of makeup. Here’s the makeup I wore in the month of November. My makeup is always quite natural, but I have been loving a bolder lip as per usual in the colder months. Face product wise, I haven’t been dabbling around too much color wise, but I did change up my base products quite a bit. I tend to be a person who switches their foundation according to the weather. There are different foundations I like in the winter time than in the summer time. 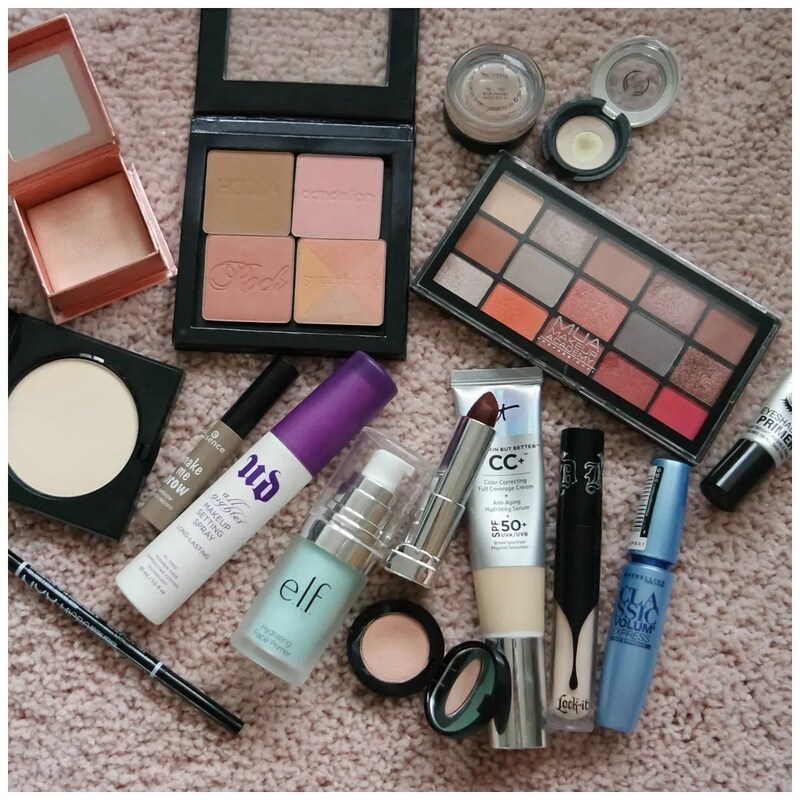 As I get paler and my skin gets drier, I simply have different makeup needs. Add on regular bike trips to get to and from work which wears down my makeup a lot more quickly, I have found I need some more heavy duty products to make sure my makeup wears well all day. Throw in a couple of staples, some warm eyeshadows and a new face powder and we have the makeup I have been wearing all month. ELF Hydrating primer – 2017 was the year I discovered primers. I never used to use primers at all. I tried the Nivea Aftershave Balm, but can’t really get over the scent most of the year and only like the cooling effect in the summer time. I bought some primers in the past year and little by little I have been trying them out and this is the first one I have become obsessed with. Milani eyeshadow primer – This is popping up month after month as my eyeshadow primer of choice. I wrote a raving review about it last month, so check that out if you want to know more. NYX Microbrow pencil & Essence Brow Gel – Some more products that you will have seen before are my current brow products. I tend to cycle through brow products one by one and use one up completely before moving on to the next. I have been loving these and the Essence Brow Gel is one I am definitely looking to repurchase soon. I reviewed it here. It Cosmetics CC Cream – A more recent addition to my makeup routine is this foundation. I reviewed it last week and having been loving it. I found my skin needed a little something extra and since this claims to have skincare benefits I decided to give it a whirl. It was love at first sight. Bobbi Brown Corrector & Kat Von D Concealer – For concealer I have been doubling things up: an oldie and a newbie product in my makeup routine. The oldie is the Bobbi Brown Corrector. I want to try and use this up before it goes bad and also the darker days have made a peachy toned corrector a must have to truly cover the dark circles. And since almost every other concealer I had been using was looking a little too dark, I whipped out a fairly new addition to see if it would be able to add a bit of life to my face and I have found it just has. Bobbi Brown Pressed Powder – Towards the tail end of the month, my MAC Prep + Primer finishing power finally gave out and so I needed a new powder to set my makeup. I like this powder, but it is quite pricey which is why I didn’t use it much until now. Benefit Hoola, Dandelion & Dandelion Twinkle – Cheeks wise I have been going all Benefit this month. After reviewing Hoola Lite and Dandelion Twinkle, I decided to try original Hoola again, which I have because I bought a kit that it was part of together with Dandelion. And I have been obsessed, but December is a good month to try and change things up again. MAC Painterly Paint Pot & TBS Eyeshadow – My standard! I love a double prime to cancel out redness on my lid and set it down to facilitate blending. MUA Fire Vixen Eyeshadow Palette – Because I wanted to give this palette a proper try before reviewing it, I wore this a lot last month. The last look you see in this blog post is what I wore continuously last month. It proved to be the perfect look to throw on quickly in the morning before going to work. Maybelline Classic Volume Waterproof Mascara – After coming home several times with my eyes looking like a racoon’s, I decided to invest in a waterproof mascara. I found my bottom lashes transferred to my lower lid and so I’ve been using the waterproof mascara on my bottom lashes mostly, but I have also used it as a second layer over my mascara on my top lashes. Maybelline Midnight Merlot Lipstick – The finishing touch was a berry lip. I love wearing these dark red/ purple shades this time of year. It does require a good amount of scrubbing, but this is a great dark shade that wears well. Urban Decay All Nighter Setting Spray – To ensure my makeup is more durable and won’t even melt off my face after a bike ride through the rain, I’ve been using a few spritzes of this to try and make it last. So far it’s been working, but I am still undecided how much I like this.